TRIPOLI, Libya - Libya's acting prime minister said Wednesday that ousted leader Muammar Qaddafi is believed to be recruiting fighters from other African countries and preparing for a possible insurgency, hoping to destabilize Libya's new regime. The comments by Mahmoud Jibril reflected fears that Qaddafi will be able to use friendly relations with neighboring countries cultivated during his more than four decades in power to help him launch a bid to return to power. "Reports have shown that 68 vehicles with at least eight fighters each crossed the Libyan borders to Mali and Qaddafi is hiding in the southern desert," Jibril told reporters. He said Qaddafi had made a deal with the Hamada tribe, which roams the borders between Chad, Sudan and Libya, to provide 12,000 fighters "to enter Libya and start the fight." Also Wednesday, Libya's transitional government said it has formally recognized the Syrian opposition's umbrella group as the country's legitimate representative, making it the first country to do so. Hassan al-Sughayer, a member of Libya's National Transitional Council, announced the decision in Tripoli after meeting with members of the Syrian National Council. The recognition is largely symbolic and unlikely to have any practical impact. Syria's government has threatened tough measures against any country that recognizes the opposition council. Meanwhile, suggesting that the U.S. also was concerned about the possibility of Qaddafi starting an insurgency, Secretary of State Hillary Rodham Clinton said during a visit to Tripoli Tuesday that she hoped Qaddafi would be captured or killed. Qaddafi loyalists already have put up fierce resistance in several areas, preventing Libya's new leaders from declaring full victory nearly two months after revolutionary forces seized Tripoli and have seized many other parts of the oil-rich North African nation. Revolutionary fighters gained control of one stronghold, Bani Walid, this week. 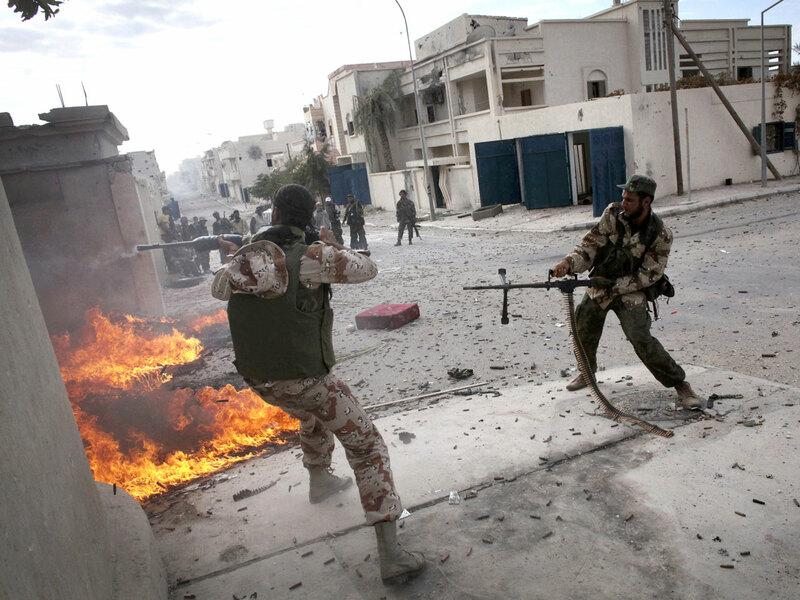 In the other loyalist bastion of Sirte, anti-Qaddafi commanders said they have squeezed Qaddafi's forces into a residential area of about 700 square meters but were still coming under heavy fire from surrounding buildings. Deputy defense minister Fawzi Abu Katif told The Associated Press that authorities still believe Qaddafi's son Muatassim is among the ex-regime figures holed up in the diminishing area. It took the anti-Qaddafi fighters, who also faced disorganization in their own ranks, two days to capture a single residential building. It is unclear whether Qaddafi loyalists who have escaped might continue the fight and attempt to organize an insurgency using the vast amount of weapons Qaddafi was believed to have stored in hideouts in the remote southern desert. Unlike Iraq's Saddam Hussein, Qaddafi had no well-organized political party that could form the basis of an insurgent leadership. However, regional and ethnic differences have already appeared among the ranks of the revolutionaries, possibly laying the foundation for civil strife. Qaddafi has issued several audio recordings trying to rally supporters. Jibril and other Libyan officials have said they believe he's hiding somewhere in the vast southwestern desert near the borders with Niger and Algeria. The U.S.-educated Jibril said he will turn his attention to working with non-governmental organizations to help fight corruption.